You’ll be need to be happy to cook in the galley, help keep the boat tidy and run helm shifts when we are doing crossings. I have sailed it from Sydney Australia in hops and jumps during 2018. I’ve done 4000 nautical miles so far. We are on the way to the Mediterranean with all stops (Malaysia, Sri Lanka etc.) in between. I’m easy to get along with, enjoy sailing the boat and don’t ask much. We share the expense of food consumption on board and I pick up the rest of the costs. 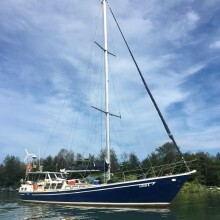 It’s a very comfortable ship and a two hander so is very easy to sail. For a 60 foot motor sailer, it’s very fast. Hopefully you are a happy and adventurous soul! Please get in touch for a chat. Boat descriptionSeawolf is a very fast ship, build out of steel and has done several circumnavigations. The ship is very roomy, cockpit well protected against all type of weather, a full galley with gas stove/oven/sink/etc and a big comfortable saloon. All and all a comfortable sailing ship that handles any type of weather. The ship has two generous cabins both with en-suite bathrooms and 2 berths in the saloon area. Ships safety; -6/8 person life raft -inflatable dingy -inflatable safety vests -EPIRB -GPS icom Facility; -automatic helm -TV -potbelly stove -waterboiler -hammock -small workshop (bow) -rope locker (bow) A comfortable motor sailer! You must be logged in to contact this member. Login or Sign up, it's FREE!